Whistling Straits in Kohler, Wisconsin is the site of the 2004 PGA Championship, and is ranked as the # 2 Golf Resort Course in the U.S. (behind Pebble Beach). Tradition, seclusion, spectacular vistas, tremendous quality of service and conditioning - all combined with a wonderful clubhouse and expansive practice facilities - Whistling Straits is truly memorable. Upon check in be sure to tour the clubhouse, and perhaps take in a breakfast, lunch or dinner in comfortably quaint dining room. The pro shop is stocked full of logoed attire and golf accessories. Upstairs you will find wonderfully furnished men's and women's locker rooms, complete with 6 private shower stalls, restrooms stocked with all the basic toiletries, and separate sitting areas/ card rooms - an extremely classy atmosphere. Your caddie will carry your bag to the driving range, which features mat and grass stations (depending on the season and conditions) and target greens. Both courses on property (Whistling Straits and the new Irish Course) emphasize the tradition of the game by supporting a mandatory caddie system. Both layouts (which share the same clubhouse and practice facilities) are also walking only ! You will find no carts on property here. A caddie fee is built into the green fees ($270 per player in season), and a tip of about $20 - $30 per player is appreciated. Our caddies did more than carry our bags and clean our clubs and golf balls. They were a tremendous help in spotting our shots - lots of trouble to get into here - and more importantly were great company, and extremely helpful as they shared their knowledge of the history and intricacies of the layout. 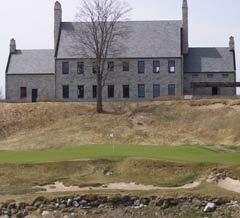 Golf on Whistling Straits is not just another day on the links. Forget about the dollars - this is a lifetime experience. Wind...during our round we were told that what we experienced was a mild breeze - about as calm as it gets. We can only imagine what it will be like at the 2004 PGA - with the pros encountering 30 mile an hour gusts as they try to avoid the strong fescue and millions of sand bunkers scattered on the fairways and protecting the greens. The layout for the tournament will measure 7600 yards - with the tees often nestled on open bluffs overlooking Lake Michigan. Interesting stuff to say the least - we have the dates circled and will be sure to watch in August of 2004! 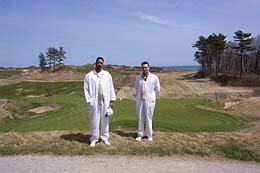 The greens at Whistling Straits are often oversized, and we were told they get quicker and firmer as the season progresses. 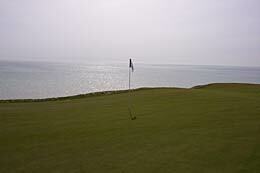 Undulations and ridges are commonplace, though we often found that putts played straighter than anticipated. Fairways are mostly wide, though the rolling terrain will often leave golfers with challenging, uneven lies - especially on shots that miss the fairway. The sand in the many fairway and greenside bunkers is of high quality - and you can also play from the beach - which is in play on a number of holes. No sand game? You are in Trouble! You will need a full selection of approaches to succeed here. The high, soft lab wedge will certainly be called for, and the execution an accurate, low bump and run that covers a good deal of putting surface is a necessary skill. A shot that can cut through a head wind, and take advantage of a wind at your back are also helpful. On our round, it seemed that the wind (sorry - breeze) always worked against us, especially on the back side. Currently the championship tees play to 7343 yards with a 152 slope. The blues measure 6893/144 slope; greens 6450/137 slope (146 for women), whites 6144/134 slope (142 for women) and reds 5381 125 slope (132 for women). We recommend the white tees for the average golfers - especially if the wind is up and if you are sensitive to your score. There are 2 par threes and 2 par fives on each nine, with just one 400 yard + par four from the white tees. The Kirby marking system is in place (yardage marked to the green's center every 25 yards from 200 (250 on par fives) to 75 yards in. You will not need to look yourself however, as your caddie will give you correct yardage to the pin on each hole. The front nine begins reasonably enough with no hole higher than the number 7 handicap involved in the initial three holes. 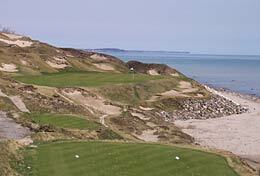 The third is a beautiful par three that begins a stretch along Lake Michigan. The fourth is the number one handicap - a long four par with a rolling fairway that slopes noticeably right to left. Attempt to land on the right side off the tee, as anything left will leave a tough uphill approach over lots of stuff you do not want to deal with. Long hitters may elect to cut some distance and reach the par five 5th in two - wind permitting. 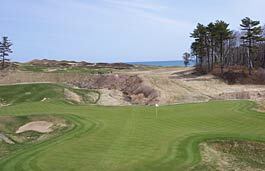 It is about a 250 yard carry over sand and fescue if you elect to try it. The safe play is to hit left of trouble to the expansive fairway. Lay up on the second to avoid the water left, and go for the green in three. Carry the ridge and land right of the bunker and you are in good shape for par on 6. Check out the tee area for the pros as you approach the par three 7th - another hole that would be excessively demanding with a strong wind. Number 8 also plays along the lake, and is followed by a par four that plays downhill - one of the most score-able holes on the layout. The tenth plays uphill into the prevailing wind - negating much of the advantage of playing a short (303 from the white tees) par four. Hit it left off the tee on eleven and you are in some nasty sand and fescue, making a par five a difficult proposition. 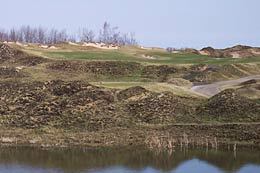 The fairway and surrounding terrain is extremely rolling, and the tee areas quite unique in this section of the course. Twelve is short and perhaps the best birdie hole on the course - and one of the most photogenic. The short par fours on 13 and 14 make this three hole stretch the "easiest" of the layout. The fourteenth bends to the left with a tee shot towards the center fairway trap a good play. Fifteen is a long par four (465 from the tips) that demands an approach from the right side of the fairway - left of the green is trouble. There is more room than it seems around the green on the unique par three 17th. Again - stop and check out what the pros will be looking at off the very back tee areas - pretty intimidating! The finishing hole plays back towards the clubhouse, and is one of only two holes that are affected by water hazards. A creek runs across the fairway at about 120 out...with fescue and sand scattered about - and concentrated heavily along the left side. Carry the bunkers left and land it about 140 from the putting complex, and you may have a pretty good shot to the green - though you will be playing out of the long rough. The fairway to the right is a safe bet - but will leave a long approach. This is a gift from the gods of golf. If you have ever longed to play Pebble Beach - and are the type of person that would shell out the $300 + to experience a round there - than Whistling Straits deserves equal respect. It is worthy!